Though the winds often come sweeping down the plains in Oklahoma, they have not blown hard enough to clear away the misguided, misleading views of Senator James Inhofe. Inhofe is a top ranking Dirty Denier because of his campaign funding from dirty sources and his terrible votes against the environment. In addition, Inhofe wrote the book, literally, on climate denialism (The Greatest Hoax: How the Global Warming Conspiracy Threatens Your Future, published in 2012). His whacky views on climate change take a page from the playbook of the most conservative groups promoting dirty fossil fuels. And if Republicans take control of the Senate, Inhofe would be in line to be chairman of the Senate Environment and Public Works Committee, where he would have a stranglehold on environmental progress. He has received an astounding $1,671,521 in contributions to his campaign committee and Leadership PAC from the oil & gas industry over the course of his political career, including $489,250 in the 2014 election cycle alone. Among his top contributors are individuals and political action committees associated with Koch Industries, the multinational corporation run by the libertarian oil baron Koch brothers and their cronies, and a leading funder of climate change denialism, and Murray Energy, the largest underground coal mining company in America, which has sued the EPA multiple times and has an outspoken climate changer denier as CEO. Oil companies ConocoPhillips, Devon Energy, Exxon Mobil, and OGE Energy are also among the top Inhofe contributors over the course of his career. Maybe they like Inhofe's outrageous claims, such as calling the Environmental Protection Agency (EPA) a "Gestapo bureaucracy", and saying that "those individuals from the far left want us to believe it's because we are contributing CO2 to the atmosphere, that's causing global warming. It's all about money." He has launched a full-on attack of the EPA's new Clean Power Plan. Inhofe consistently votes against the environment: he has taken numerous votes against cleaning up carbon pollution, against cleaning up pollution in our air and water from power plants and industrial farms, and against funds for disaster relief and shoreline planning in the wake of Hurricane Sandy. Yet he strongly supports subsidies for the oil, gas and coal industries despite their record profits and lower than average tax rate. This is why he has a lifetime score with the League of Conservation Voters of only 5 percent, among the very worst in the Senate. Our advice: While Senator Inhofe continues to deny humans are contributing to climate change, 67 percent of Oklahomans want "the government to step in and limit greenhouse gas emissions from industry." 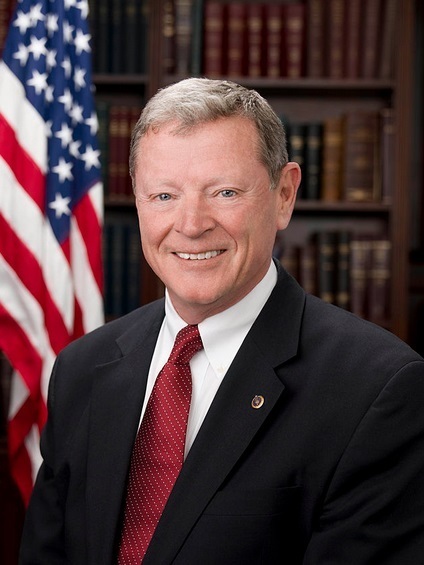 Senator Inhofe needs to start aligning his votes with his constituents. It's time for action to protect Oklahomans and Americans across the country from the health and environmental impacts of the dirty, old fossil fuels industry.